Africa is a continent of vast distinction in culture, religion, history and people. It is a basin of 54 countries and is like looking into a kaleidoscope; the myriad of colours splinters and fuses, reorganising its structure every single second. Our contemporary time knows of an Africa that is recovering from the traumatic repercussions of the Neo-Imperialism, in the milieu and in the wake of a shaken equilibrium. Albeit, no one can deny the inseverable need to express life in art. The question of identity looms over our heads. There is a heavy influence from the Arab world in countries like Tunisia, Egypt, Morocco, countries that are in the Mediterranean region. In Sub-Saharan Africa, we see many communities and many ethnic tribal identities at play. 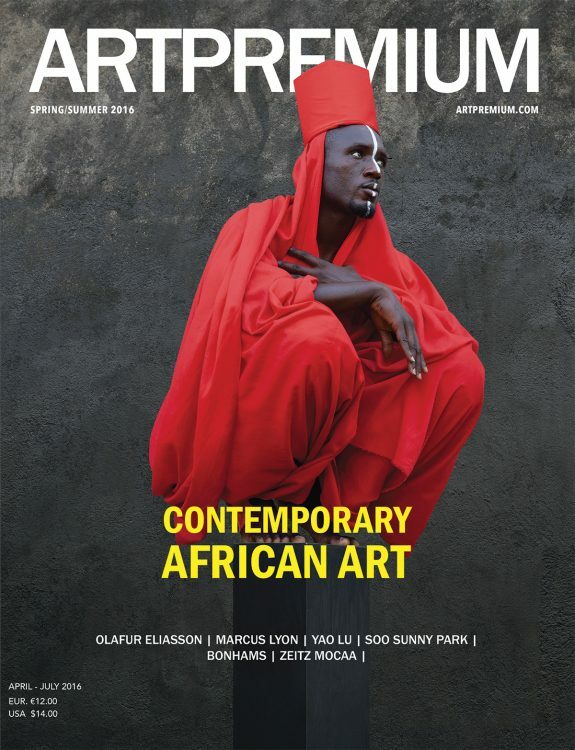 For that reason, we have made an editorial decision to offer a subjective excerpt of the rich contemporary African art scene that is not exhaustive but is still representative. In the following section, we take a selection of creative narratives, predominantly of the life and world of Sub-Saharan Africa, an outlook of the contemporary art life on the continent and everything related to it. Starting-off is our portfolio of the 22 African artists to watch, followed by articles on art fairs, auctions on the market, collectors, curators, exhibitions, foundations and museums to showcase the undeniable presence of contemporary African art globally. Contemporary art is a looking glass through which we understand the world we live in. Artists provide pieces, via their artworks, to the puzzle that makes Africa. Zimbabwean artist Kudzanai Chiurai exposes important political issues of his home country and of xenophobic violence. Abdoulaye Konate’s work alludes to the political tensions surrounding the Sahel region, and the HIV/ AIDS epidemic in the Malian society. South African artist Tracey Rose is one of the many female artists in Africa that advocate for feminism in their artistic creations, questioning sexual, racial and gender stereotypes in the African context. Peju Alatise and Julie Mehretu are two other examples of that context, born in Nigeria and Ethiopia respectively, they have both dedicated their artistic career towards creative education of the young female generation. From the pertinent themes of human rights, identity disillusionment, confidence and extravagance that we tear out from contemporary art productions by African artists, we can then dissect the present-day artistic scene in Africa and discover the intricate interactions both locally and globally. Many Sub-Saharan African countries adopted the European institutional cultural policy, where the government is often the sole supporter of the development of the arts. Take the case of Angola, the Austral African nation places a strong emphasis on the close knit relationship between the state and culture ever since the 1940s. In 2011, the first Angolan cultural policy law was passed declaring a clear Culture-Nation link and promises fiscal benefits to companies that fund cultural institutions. A rather fragile system, perhaps not for everyone on the continent. There are undoubtedly countries that have been through and are going through economic distress, whether natural calamities or man-made misfortune, leading to a lack of arts funding from the public entity. Undeterred by adversity, the desire to express artistically perseveres. A fact that few people know, the master Ghanaian artist El Anatsui has been teaching, for over 40 years, at the department of sculpture in the University of Nigeria, a country, which till this day, deals with the overwhelming task of unifying an ethnically diverse nation. The proliferation of artistic creation on the continent creates a domino effect – piquing the interest of collectors to give more funding for cultural institutions and attracting more external attention. Art education is thus imperative in the African contemporary agenda. The collaborative model between the public and the private sector has provided innumerable compelling opportunities in that regard and beyond. Beninese art collector Marie-Cécile Zinsou founded the Zinsou Foundation in 2005 with a humanitarian approach building up knowledge and appreciation for visual arts through education for the younger generation. Swiftly following the oil boom on the continent in the 1970s, Africa’s economy has shown substantial growth. It has, henceforth, contributed to the surge in number of native wealthy investors and collectors. The collection owned by the Congolese businessman Sindika Dokolo is considered to be one of the biggest collections of African art on African soil. This Public-Private collaboration does not simply benefit the private sector; the contemporary African art sector is showing a certain strengthening of its infrastructure. Joining the ranks of Musée Zinsou in Ouidah, Benin established in 2013, Zeitz Museum of Contemporary Art Africa is scheduled to open in 2017 in Cape Town, South Africa. Local and global art collectors, like Marie-Cécile Zinsou and Jochen Zeitz, join hands with the municipal government to develop a context for contemporary art in Africa that is accessible to the greater public. The proliferation of artistic creation on the continent creates a domino effect – piquing the interest of collectors to give more funding for cultural institutions and attracting more external attention. Commercial art galleries flood in to join this artistic celebration during local exhibitions, for example, FNB Joburg Art Fair in South Africa, LagosPhoto in Nigeria, the Luanda Biennale in Angola, the Doual’art Triennale in Cameroon, Bamako Encounters Biennale in Mali and so forth. 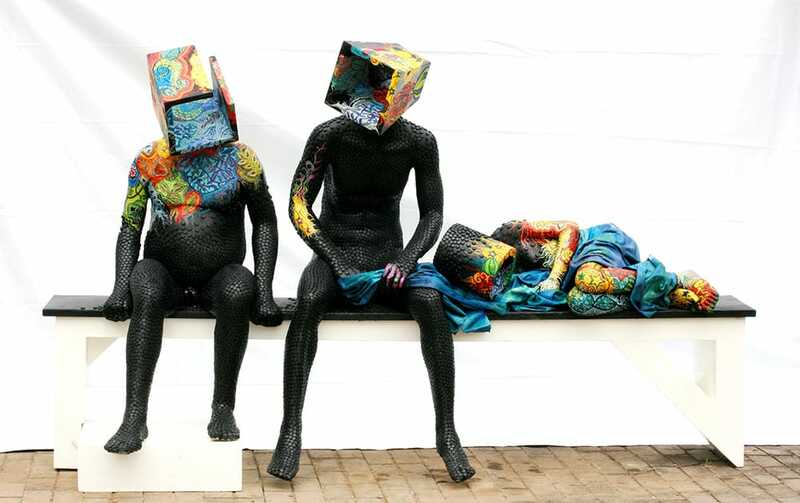 The number of Biennales has skyrocketed by 50% in the past 5 years, increasing to 15 within Africa. This growth has gained the art world’s favour. Internationally, Angola has won the coveted Golden Lion at the 2013 Venice Biennale with their pavilion Luanda, Encyclopaedic City presenting the work by the Angolan artist Edson Chagas. In 2015, the 56th Venice Biennale was curated by the Nigerian-born art magnate Okwui Enwezor. Established galleries like Goodman Gallery, founded in 1966 at the height of Apartheid in South Africa, offers a non-discriminatory space and facilitates for the on-going dialogue of freedom of expression. They function as vessels, to promote emerging local artists from the inside out, to world-renowned art fairs like the 1:54 Art Fair in London and New York, and to usher in more investment opportunities. Look at Nigeria and South Africa! The two largest African economies have founded their own fine art auction houses, ArtHouse Contemporary Ltd. and Stephan Welz and Co Ltd. whose sales are prospering domestically and internationally. There is a formidable presence at the auction turnover for sale on selected major players like William Kentridge, El Anatsui, Ben Enwonwu, Sokari Douglas Camp and Irma Stern. This has been coming from the internal market for the past 15 years. Conscientious of the diversity, there is no one single African narrative, we are also aware of the reachability of technology and telecommunications. There is currently an explosion in Africa of international connectivity that unleashes potential to fuel more strenuous growth for local artists. This upsurge in communication with the external diversifies the artist’s portfolio, giving them a better channel to integrate into the international art circuit and a momentum to expand their artistic career. For instance, The Uncanny, a photography serie by the Belgian photographer Leonard Pongo, unveils the everyday life of a group of Congolese people living in the outskirts of the city.